As per the latest report by IDC, it is found that a whopping 51.4% of Indian smartphone market share in Q1 2017 is occupied by Chinese vendors which recorded 142.6% growth compared to last year at the same period, and 16.9% increase compared to the previous quarter – Q4 2016. Just like as mentioned in my earlier article, none of the Indian-based mobile vendors has shown any significant increase in market share this quarter too. There was a marginal drop from 40.5% [in Q1 2016] to 13.5% in Q1 2017, and the same fall might continue next quarter too. All these trends conclude that Indian mobile users have evolved to a stage that they are more interested in a bigger screen camera phones which have the recommended feature – 4G VOLTE support. The same trends might continue all over the year 2017, and this may turn down most of the Indian mobile vendors who’re still into 5′ 3G phones. Though they occupied significant portion last quarter, their market share has come down to the least value now. So, what made the Chinese mobile vendors to dominate the Indian smartphone market share in Q1 2017 again? To know the answer, let’s have a look at the top 5 smartphone vendors in India – Q1 2017. As usual, the South Korean Electronics giant is still in the lead, and it recorded a market share of 28.1%. There was a whopping 21.7% of increase compared to same quarter in the last year. As already told in the trends, Samsung Galaxy J2 is the second highest shipped smartphone this quarter. Other Samsung smartphones like C9, A-series [2017 editions], etc. have contributed to the overall shipments which made Samsung wear the crown again. Out of nowhere, Vivo climbed to the 3rd position in the list of top 5 smartphone vendors in India – Q1 2017. Even last year, it showed a growth of 29.9% [as compared to Q3 2016] and this quarter it’s around 44.2% compared to Q1 2016. As already explained in the trends, Vivo was one among the companies which led to the Selfie-centric smartphones. Almost all the smartphones launched by Vivo has over a 13MP camera, 5.5′ inch screen and is priced more than $150. 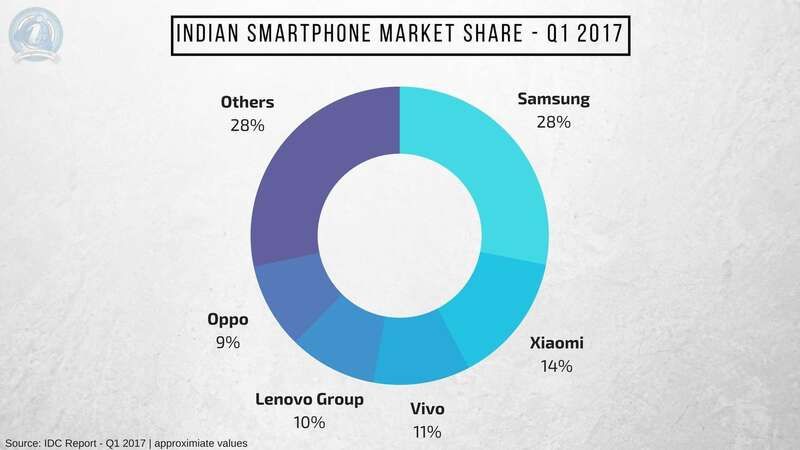 All these smartphones sales made Vivo occupy 10.5% of smartphone market share in India. The growth will still continue as the brand is concentrating more on offline stores with its aggressive marketing technique. I did write an article on how it’s defaming the brand, but the company is getting profits, as at the end all they care about is YOY growth and smartphone shipments. So, I want the consumer to decide how far the Vivo can go! Thanks to the Vivo, Lenovo has fallen to the 4th position this quarter. Though there was a drop in position, the company has a recorded a healthy growth in overall shipments. The new Moto G4 & G5 series have a real impact on the smartphone shipments from Lenovo. It recorded a 9.5% market share which is 33.7% higher compared to same quarter in the last year. As Vivo has moved to the 3rd position, Oppo has fallen to the final position. But, compared to last quarter, Vivo has occupied a significant market share in India. The smartphone sales grew by 14% compared to last quarter and are more than double compared to Q1 2016. This growth was due to the offline stores and thanks to its aggressive marketing like Vivo, the camera phone firm has occupied 9.3% which is very near to Lenovo market share. Indian consumers are evolving but in a wrong way! They’re falling for misguided advertisements and the recent OnePlus ad is an example. Even Oppo & Vivo are known for misleading advertisements, but it’s the Indian consumers who need to understand that having a camera-based phone will never meet the performance you’ve been looking for. As already explained in the previous article, the rise of Chinese-mobile brands has come to a saturation, and they’ll continue to dominate as long as Indian mobile brands fail to produce a smartphone with better specifications for a reasonable price-tag. Till then, you can expect Oppo & Vivo continue to dominate the offline with their aggressive marketing while Xiaomi continues to dominate the online sales. Previous articleChoosing Between Proxy and a VPN – which of the Tools to Use?